Mackinac Island State Park is a popular Mackinac Island area destination located only 12.2 miles from the facilities of Mackinaw Mill Creek Camping in Mackinaw City, MI. Governed by the Mackinac Island State Park commission, Mackinac Island State Park is free of charge and open year round. No motor vehicles are allowed on Mackinac Island, so there is no ferry equipped to transport motor vehicles to this National Historic Landmark. Many people who intended to book a campsite at Mackinac Island State Park (camping is not permitted on Mackinac Island) are now longtime returning visitors to Mackinaw Mill Creek Camping. A centrally located, large campground with many facilities, Mackinaw Mill Creek Camping is convenient to visitors looking for Northern Michigan attractions such as Mackinac Island State Park. Camping styles vary widely and many State Parks may not be a good fit for some campers. Mackinac Island State Park varies in their accommodations, features and facilities compared to Mackinaw Mill Creek Camping, so we have gathered information on Mackinac Island State Park and contrasted them with Mackinaw Mill Creek Camping. 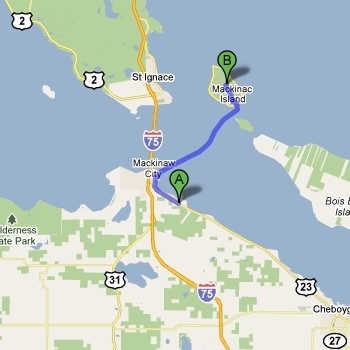 The chart below compares Mackinac Island State Park versus Mackinaw Mill Creek Camping. Dozens of site types No camping or lodging. 200 Full Hookup Sites No camping or lodging. Variety of Lakefront Cabin Rentals No camping or lodging. Large RV Sites, Seasonal RV Sites & RV Sanitation Station No camping or lodging. Natural Beaches, Trails, Metal Detecting Variety of local attractions. No extra fee charged for registered guests. No fees required for entry. I just wanted to drop you folks a line and tell you how much my wife and I enjoyed our stay at your campground during the Michigan State Holiday Rambler Rally. We had not been up in your area for over thirty years, and it was our first stay at your facilities. I was impressed with how you handled all of us upon our arrival. Your hospitality was GREAT! The campground is beautiful. Thanks for a great time, and hopefully we can join you again in the not too distant future. By the way, we appreciated the great weather too. Thanks again!